or all together as a complete kolak. - Put all the ingredients together in the cooking pot. - Cook until it boiled. - It's ready to be served. 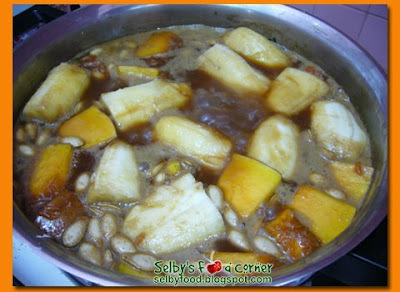 Selby That sounds incredible.I bet it is just delicious! What a beautiful dessert. I would have never thought of bananas and pumpkin together but I'm sure they compliment each other beautifully. Great idea for tea. Mmm, that looks so tasty! I looooove coconut milk! what a treat! I should be mad at you because where am I going to get dome of this? just like our very own version of sweet soups aka tong sui. Wow Selby! That looks so delicious! msian food n indo food is starting to be to hv a lot of familiarities ..
and thanks to you, for persistently bloggin abt indo food, i get to knw so many dishes! I have not heard of this before. It looks absolutely delicious. I'm just dying to come to your house and just EAT! Mmm... that sounds like a delicious dessert with banana and pumpkin! This is interesting, I never know all this ingredients can add up as a dessert. Would love to try it out ourselves. But some ingredients doesn't seem to be available in the UK. Would try it out when we're back in KL! Thanks for the recipe! Always great dish that I've never seen before. Looks good. looks like a real energy giver! i should eat this b4 my run! looks delicious!! i never tried banana with pumpkin dessert before, i bet this taste great!! Delicious- it's like a fruit soup! Sounds like it would be very tasty! Yum! What a yummilicious dessert! Did your mom cook the pumpkin seeds as well? I saw some white seeds floating in the dessert. oh, this looks good. 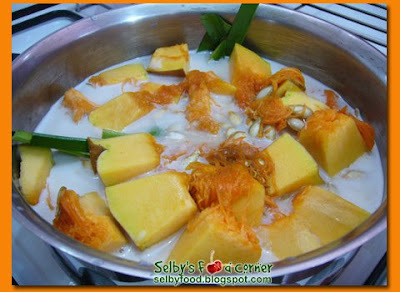 this is very similar to what we have in our country that's called "ginataan" or "binignit" (in my dialect). Yum! Looks delicious, I would love to try it! I've not heard of this dessert, but it looks interesting and tasty. 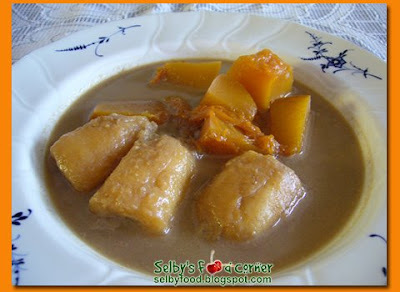 Almost like a fruit soup/stew and I certainly love banana, pumpkin and coconut. I may be coming to Indonesia this year on a trip so I will have to make a note to keep my eye out for it if I do. how are you Selba? i've got a question about the bananas used in this kolak. what kind was that? kepok? tanduk? raja? pizza smizza: Hi there... nice to see you in here again :) Well, mostly all kind bananas can be used in kolak; but for this kolak, I used pisang kepok but then it all back to preference. In Jakarta, people usually use pisang uli or pisang tanduk (but fyi, pisang tanduk is more expensive). In Bandung, the preference is using pisang uli for kolak. 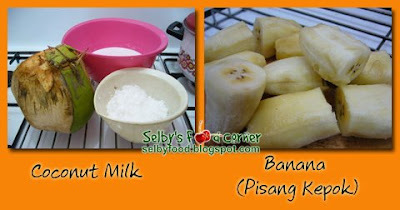 As for pisang raja, people hardly use it for kolak because pisang raja is considered as the most expensive banana.